No doubt you've missed those sweet blueberries, yummy baked treats, and free-range chicken as much as we have. Happily, our wait is over. Our favorite farmers market, the Pike Central Farm Market, returns to the parking lot at 5922 Executive Boulevard (at the corner of Old Georgetown Road and Executive Blvd) this Saturday from 9 a.m.-1:30 p.m.
On Tuesday, April 28, from 5pm – 9pm, you can fill your stomach with delicious food while filling the coffers of Friends of White Flint. Simply enjoy dinner at ShopHouse Southeast Asian Kitchen in Pike & Rose on April 28th from 5pm to 9pm and mention Friends of White Flint. 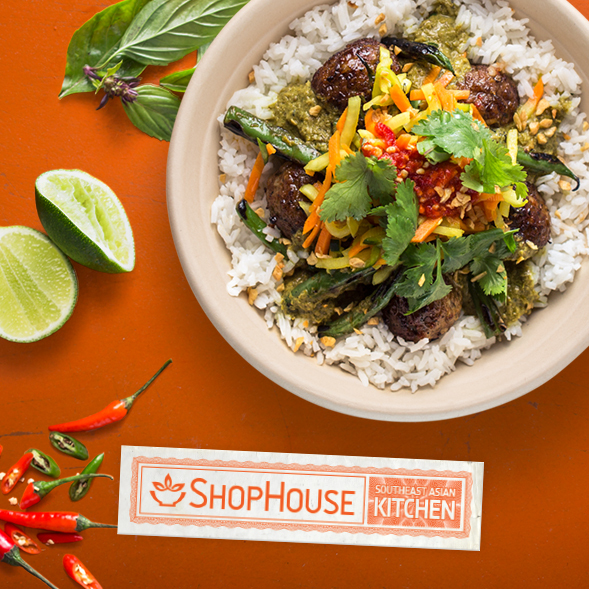 That's all you need to do, and ShopHouse will generously donate half of the cost of your meal to Friends of White Flint. Please cut and paste this announcement of our April 28th ShopHouse fundraiser and email it to friends, family, colleagues, and neighbors. It's not often that you can do so much good simply by eating food this good. The Gables project is a much-anticipated 476-apartment complex with 31,000 square feet of commercial space set to be built on Old Georgetown Road. On April 30, the Planning Board will review The Gables’ preliminary plan and site plan for the project. As you may recall, this project requires the realignment of Executive Boulevard (the Western Workaround) and will hopefully bring the new parking required for the expansion of Wall Park. And the Pike District logo is …. News from the Friends of White Flint. White Flint 2 Plan could get underway this June. The Pike District offers unparalleled variety in housing choices - all within easy walk of shops, dining, and Metro. The following list of new housing recently constructed or soon-to-be constructed comes from this months' edition of Bethesda Magazine. 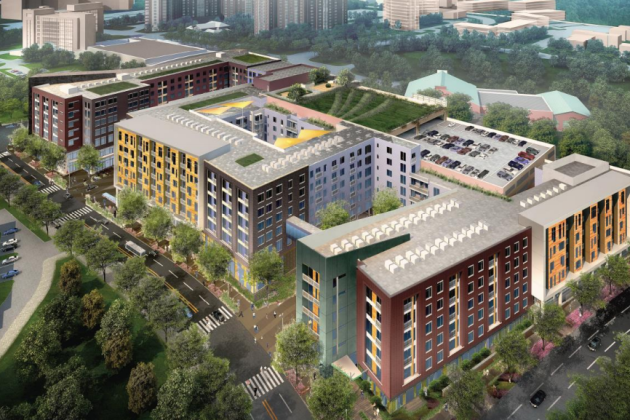 DETAILS: This six-story apartment building opened adjacent to Rockville’s Twinbrook Metro station in 2010 and features one- and two-bedroom units ranging from 640 to 1,255 square feet. Every residence has 9-foot ceilings, and some feature a two-story loft design with a 17-foot ceiling. Buildingwide amenities include a 24-hour concierge, a club room with billiards and lounge space, and an outdoor saline pool. The fitness center has an on-site personal trainer and hosts classes for residents. Rents range from $1,640 to $2,200 per month. ADDRESS: 1620 E. Jefferson St. DETAILS: This apartment building has 146 units ranging in size from 650 to 1,400 square feet. Monthly rents range from $1,530 to $2,286. The units feature quartz countertops, walk-in closets and mosaic tiling in the bathroom. Some apartments also have 9-foot ceilings, bay windows, a fireplace and a private balcony. The building has valet and dry-cleaning services, garden pathways and a reflecting pool. Other amenities include a residents’ lounge, fitness center and media room. DETAILS: This apartment building, scheduled to open in late 2015, will have 356 one- and two-bedroom units. Residences will come with stainless steel appliances and hardwood floors, and some floor plans will include a den. Building amenities will include a pool, fitness center with an outdoor area for yoga, and four landscaped courtyards. ADDRESS: 1626 E. Jefferson St. DETAILS: Currently under construction and slated to open in the fall, this apartment building is geared toward baby boomers. Forty-eight units with one-, two-, and three-bedroom models will range from 750 to 1,430 square feet. Each residence will feature an open floor plan, slip-resistant tiles on the bathroom floor, a bench seat in the shower, and bright under-counter and task lighting in the kitchen. Wood vinyl flooring, in-unit high-speed Wi-Fi and walk-in closets will be found throughout each space. All units will have 9-foot ceilings, and most include a balcony. Buildingwide amenities include a concierge, fitness center, club room with a catering kitchen and outdoor gardens with patios and grill stations. Rents range from $2,500 to $4,000 per month. DETAILS: Slated to open this spring, this apartment building will have 214 units, including studios and one- and two-bedroom residences. Some of the two-bedroom units have a two-story, loft-style design. Each unit features hardwood flooring and granite countertops. A game room will include a poker table, foosball table, shuffleboard, flat-screen television and a glass door that can be removed when the weather is warm. There will also be an outdoor pool and fireplace. Rents range from $1,585 to $2,870 per month. DETAILS: This 341-unit apartment building sits next to a Starbucks and a Harris Teeter grocery store. The building, which opened last summer, has a pool, club room and game room with shuffleboard, table tennis and foosball. There is also a bike repair center, parking garage and fitness center. Rents range from $1,403 to $4,000 per month. DETAILS: This 19-story, 319-unit complex will open this spring, offering one-, two-, and three-bedroom floor plans, including 24 two-level penthouse residences. Units range from 646 to 2,007 square feet. Buildingwide amenities include a 24-hour concierge, library, club room, fitness center with a yoga studio, and a terrace-level pool and lounge area with a demonstration kitchen. Rooftop garden plots will be available to residents for an additional fee. Underground parking is available for every unit, and the building is pet-friendly. At press time, rents were not available. DETAILS: Open since last June, this apartment building has 174 one- and two-bedroom units with rents that range from $1,700 to $3,000 per month. Seven penthouse units feature 15-foot ceilings, and all units have stainless steel appliances, granite countertops and hardwood floors. The building has an outdoor pool, a gym with access to a personal trainer, monthly networking events and laundry and dry-cleaning services. The building is pet-friendly. DETAILS: Ninety-nine luxury three-level town homes will range from 2,497 to 3,396 square feet and are slated to open in November. Each residence features a two-car garage, an in-unit elevator, and a private rooftop terrace that overlooks 33 acres of wooded nature preserves. Kitchens will be outfitted with Thermador and Sub-Zero appliances, and living rooms will have a gas fireplace. On-site visitor parking will be available. Prices start at $1.1 million. DETAILS: This community of 112 luxury town homes opened in 2012. Located steps from The Music Center at Strathmore, these four-story, brownstone-style residences range from 3,200 to 4,200 square feet, and each features a two-car garage, an in-unit elevator, and two terraces—one on the roof and another on the kitchen level. Kitchens are outfitted with Viking appliances and granite countertops, and the master bath has Waterworks fixtures. The remaining units cost from $1.3 million to $1.8 million, and new residents get three years of special member benefits at Strathmore.